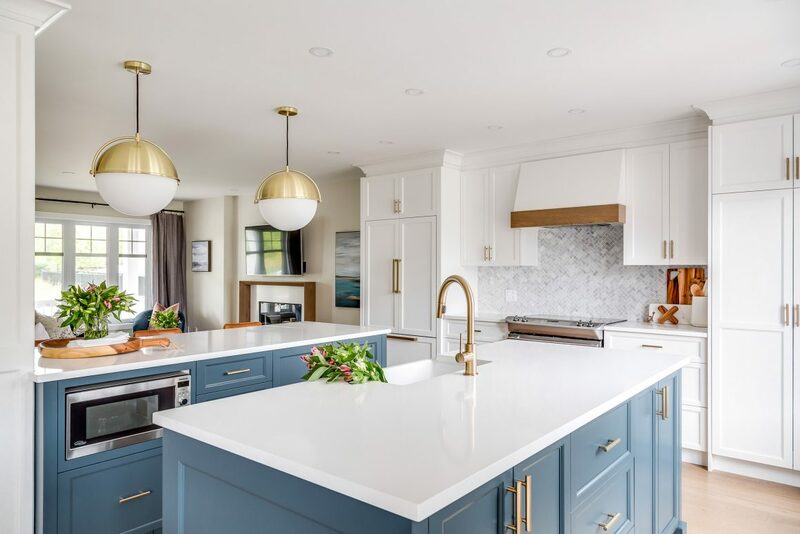 The dual kitchen islands are finished in a rich blue tone and topped with white quartz. 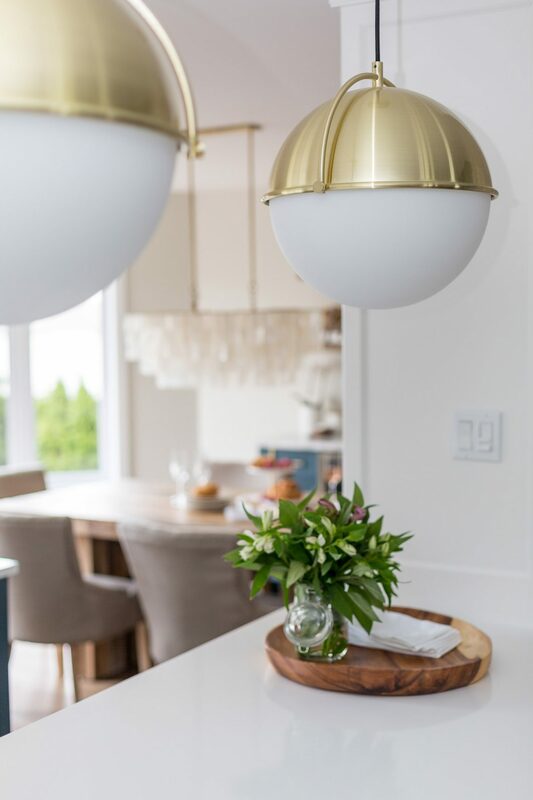 Oversized globe pendant lights illuminate the space. 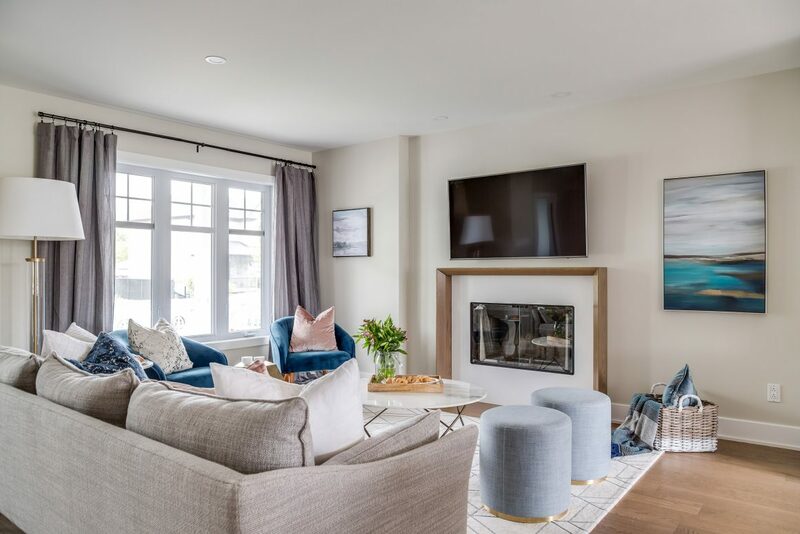 In 2016, Monica Sposato and her husband Shawn were looking to buy a home in Laval. In fact, they had their eye on one particular area, a relatively new development. Monica would walk her dog there looking at the houses, imagining herself living there, with the Centris app on her phone at the ready. Camel-coloured stools provide a warming touch, Triandos says. Then, she found it: A two-storey home with a full basement. It was in the perfect area, except: “It was not to our liking in terms of style.” They made an offer anyway. The sellers countered. Monica and her husband responded, but this time they included a rather odd contingent. 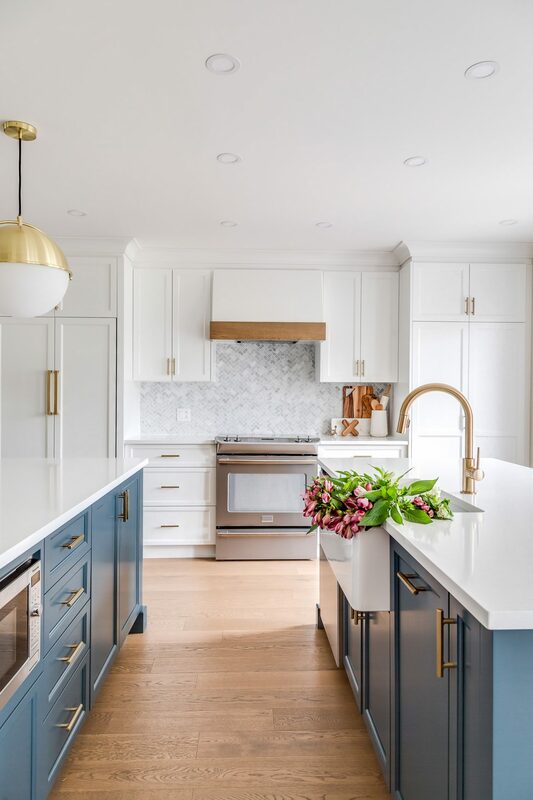 Brass hardware adorns the blue island cabinets and the white cabinetry along the wall. The brushed brass faucet at the farmhouse apron kitchen is by Delta. Cabinet maker: Danemma. “Our second offer was on condition that our designer has to approve it,” Monica says. She had called one of her good friends in the interim – interior designer Eugenia Triandos. The question she had: Could Triandos make the interior of this 10-year-old house work for them? “The seller refused to accept the condition,” Monica admits, but they went ahead and bought the house, nonetheless. As for Triandos, she was on the project before Monica and Shawn even had the keys. 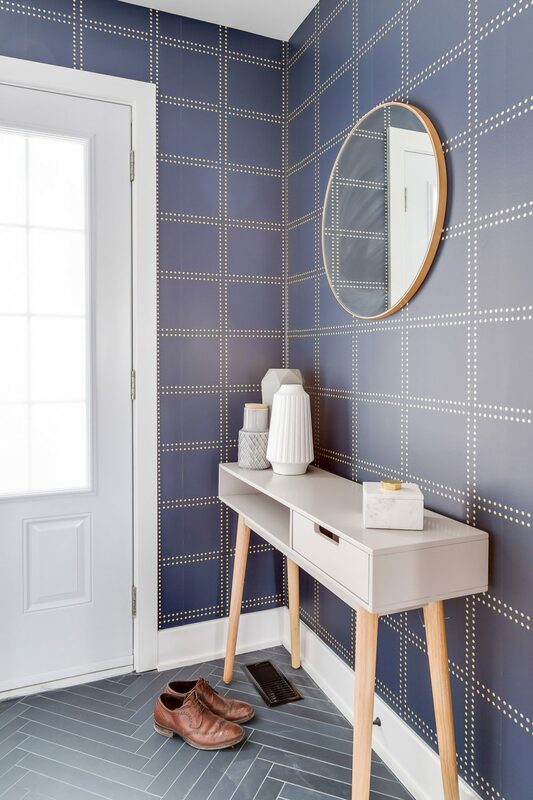 “They wanted to renovate the entire first floor and the upstairs bathroom,” says Triandos, who is also the co-owner of Hibou Design & Co., a Montreal-based boutique design studio. 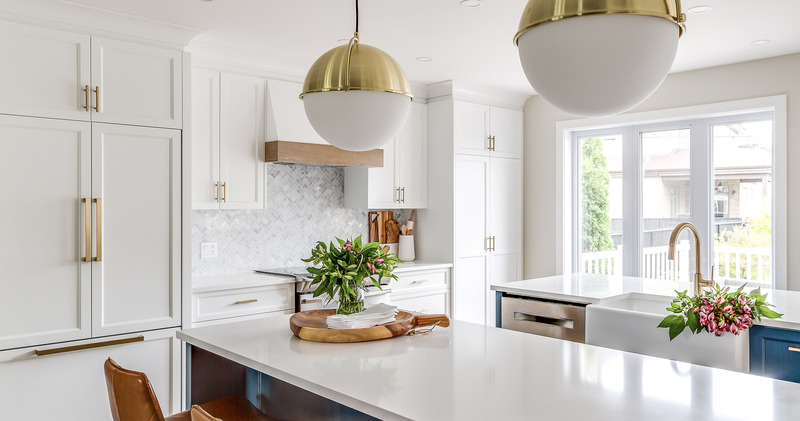 The focus was going to be on the kitchen – specifically, where it should be located, opening it up and eliminating the formal dining room. 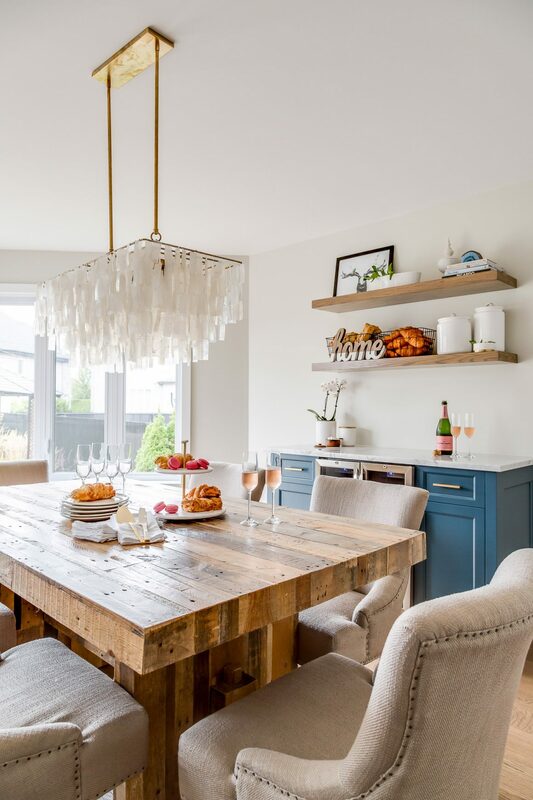 The dining table stands beside a bar that mimics the kitchen islands. 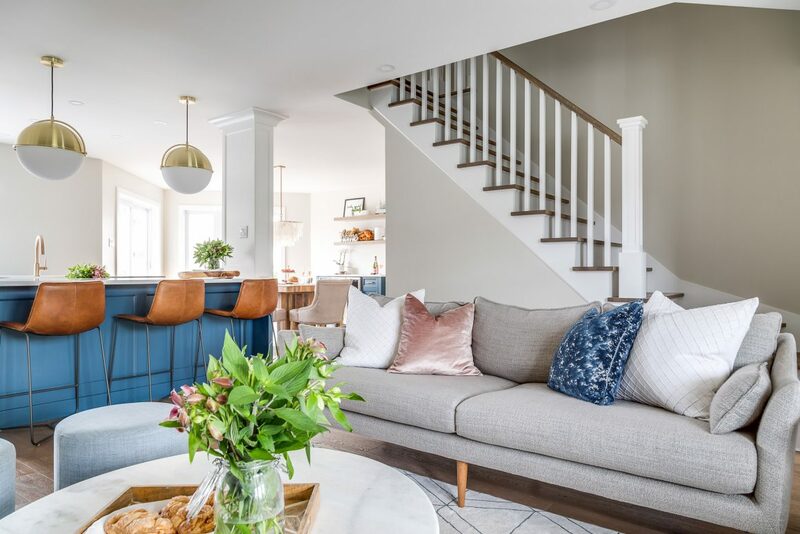 Monica wanted an open area designed for entertaining. The kitchen was going to be the focus of the home. Could an Italian who loves to cook have it any other way? “We reworked the footprint,” Triandos explains. Construction Redev Inc. went to work on the renovation, stripping the entire main floor to the studs. “It’s not your traditional layout,” she says, describing what they ended up with. Triandos had the position of the dining room and kitchen swapped, providing more room for the latter. The flooring wood was also used on the fireplace surround, the floating shelves above the bar, and the range hood in the kitchen. 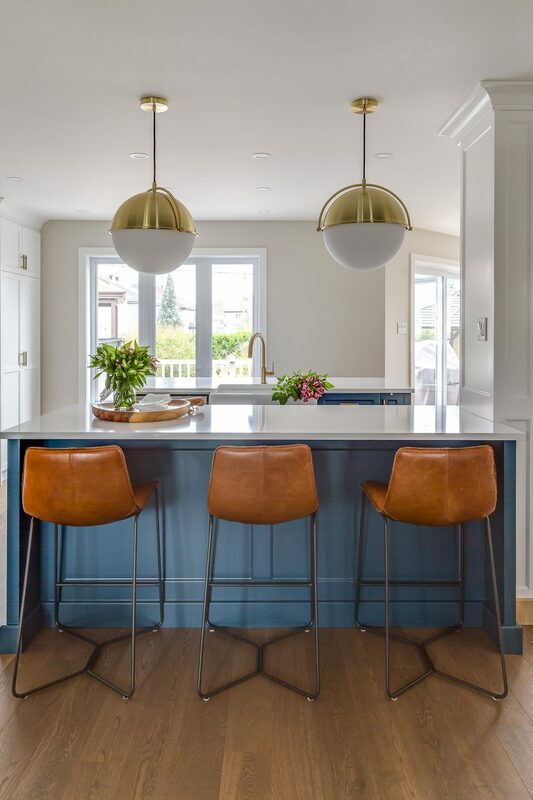 Accent colours – from the chairs to cushions and ottomans – play off the colours in the kitchen. As they discussed options, Triandos pitched an idea that was “a little bit out of the box:” Two islands. “We were 100 per cent for it,” Monica says with enthusiasm. “It’s probably the number one feature of the house that we like most. “We each have our own spots in the kitchen. 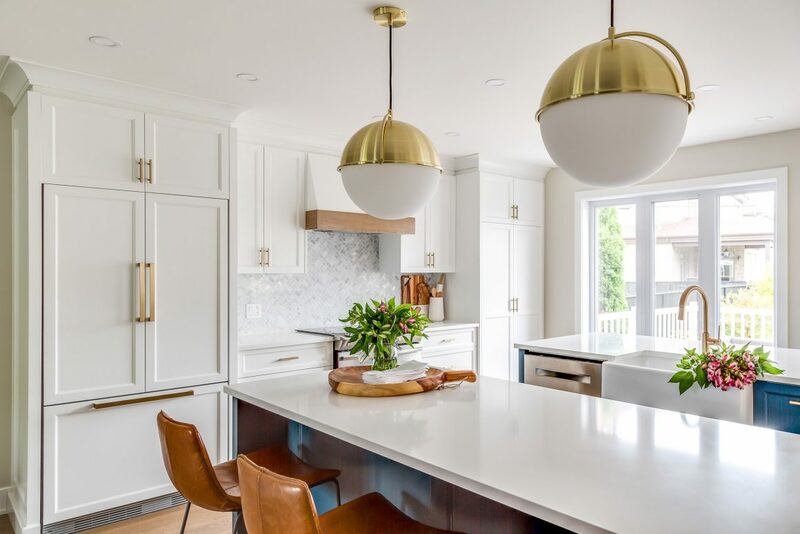 We work harmoniously now.” And she is thrilled with the amount of storage space the islands provide, while eliminating the need for upper cabinets that would have limited the openness the space now has. And the islands are great when hosting. One is used to prepare food, while the other provides a surface for platters and cutting boards to serve cheeses and hors d’oeuvres. 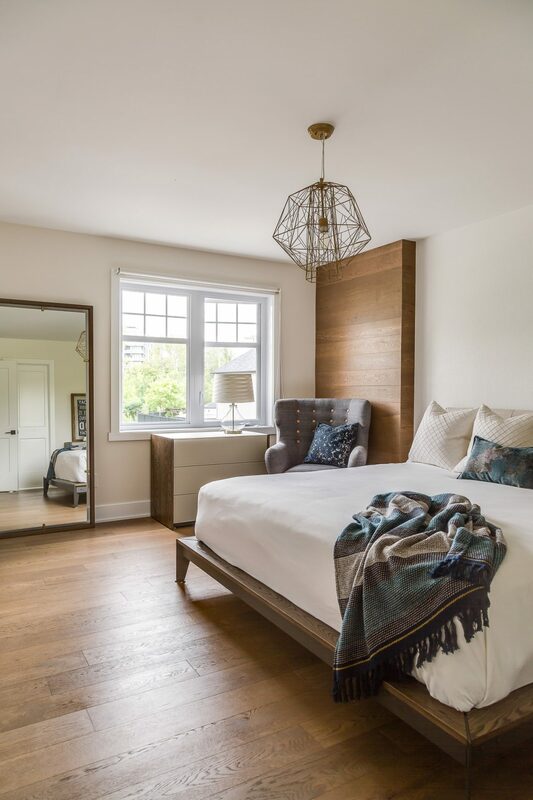 The wood in the bedroom gives the space warmth. Wide-plank engineered bleached oak covers the floor and the check in the corner. Furniture: Maison Corbeil. Once the owners were sold on the two-island concept, Triandos threw out another idea: Colour. How daring were they willing to be? “I know Monica pretty well. She’s fun, light-hearted and I wanted to reflect that,” Triandos says. Call it an idea that came out of the blue: a teal colour to be precise. “My husband was: ‘Yes! One hundred per cent!’ ” says Monica. 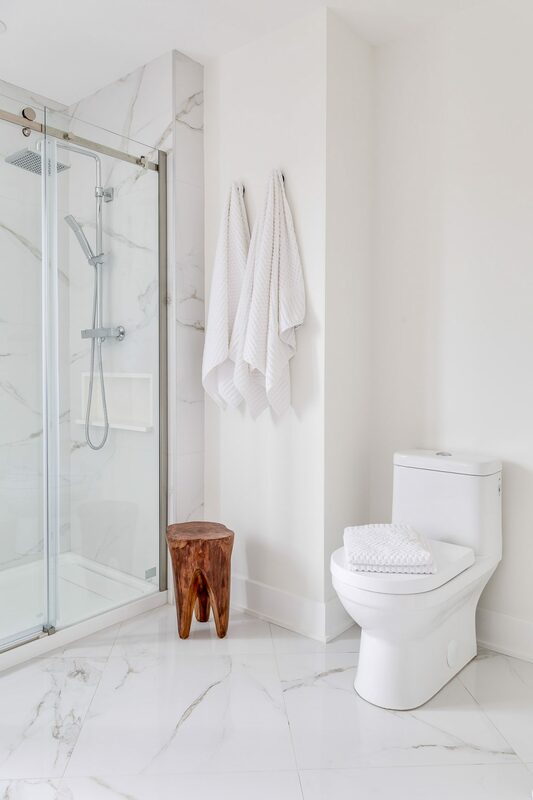 The upstairs bathroom is sleek and contemporary in design, in whites, greys and black. 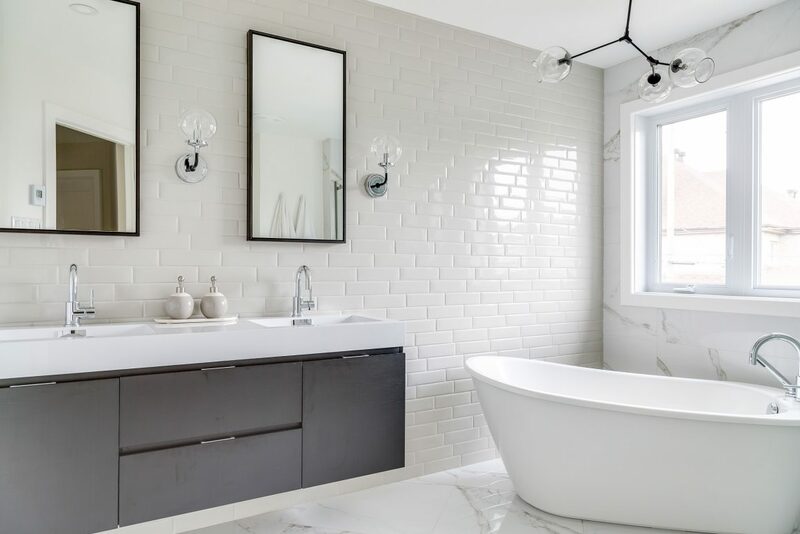 Elongated subway tiles with rounded edges are on one wall with a black floating double vanity, while 24-by-24-inch porcelain tiles cover the floor and the other walls. Upstairs, they went in a different direction, opting for a sleek contemporary look, mainly to meet Shawn’s taste. 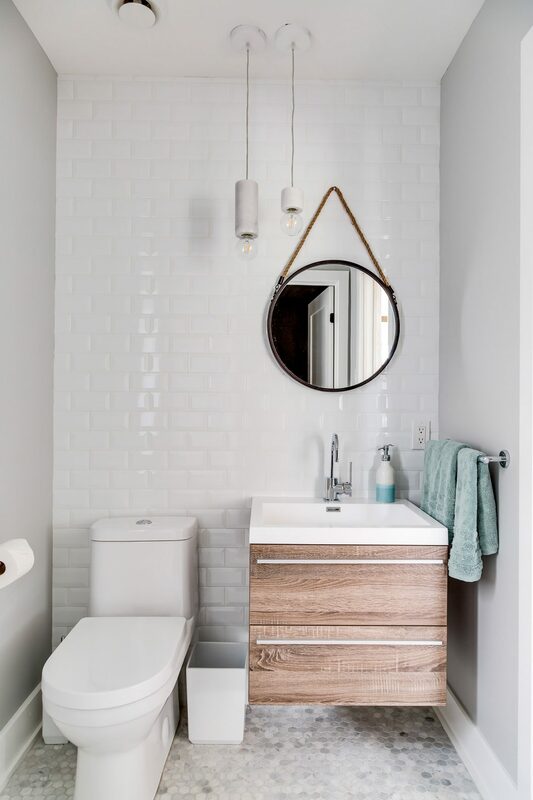 The new bathroom features a white large-tile-porcelain floor, a free-standing soaker tub, a subway tile wall, and a black floating vanity. “It’s ultra modern,” Triandos says. In the master bedroom, the oak floors were repeated, but this time the wood also covered a small check in the corner of the room. 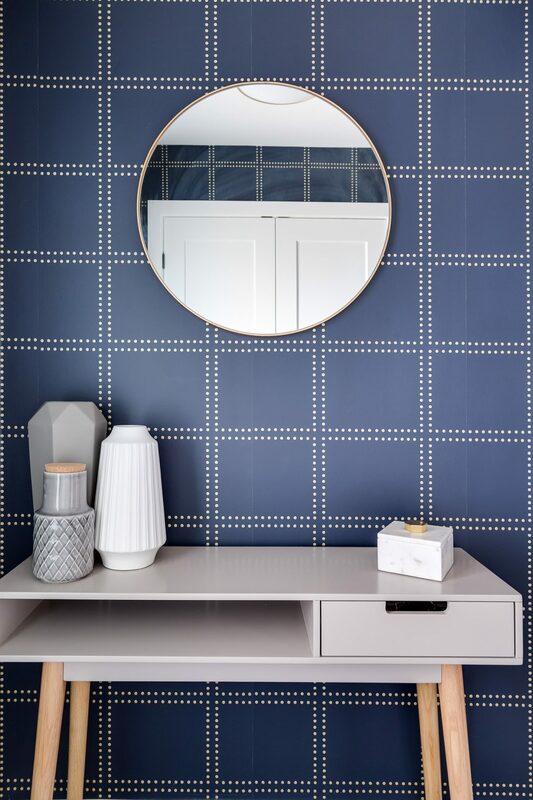 “With a check in the wall, you can either ignore it or accentuate it,” Triandos says. She opted to make it a focal point to add warmth to the space.